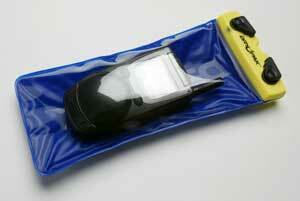 The Dry Pak is a compact holder for your cell phones and PDAs. It is waterproof, made of a toughened plastic with a clear front and a padded back. While it is handy that this sleeve is waterproofed, I would be more interested in protecting my stuff from sand. There isn’t anything much more annoying or inconvenient than taking your new iPod to the beach and getting it scratched by sand.